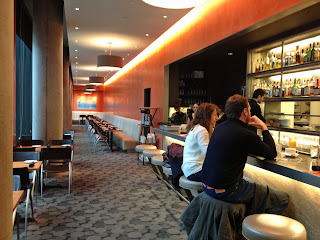 My friend Jaimee and I checked out early from the Hotel Ivy in Minneapolis. We had a full day ahead of us to explore. 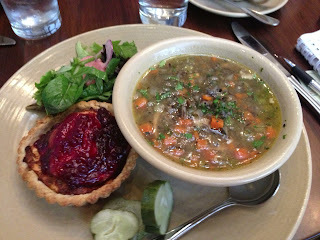 Our first stop was for brunch at Spoonriver, in the Mill District that runs along the Mississippi River. The food that chef/owner Brenda Langton offers here is local, organic and gourmet. She’s also come up with an interesting cocktail menu to bring into the restaurant. The brunch menu at Spoonriver definitely had my attention and I knew right away it was going to be tough to narrow it down. I was especially impressed with all the vegetarian and vegan items, which all sounded good. 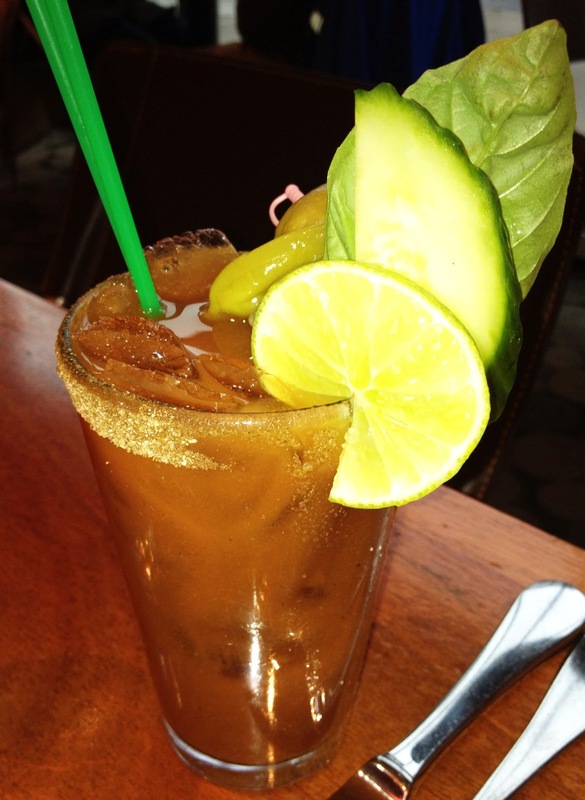 We ordered the Bloody River (voted best by Minneapolis/St. Paul Magazine) and the scone of the day cherry, banana and coconut. Both were wonderful and we were beginning to think we couldn’t go wrong with anything ordered. 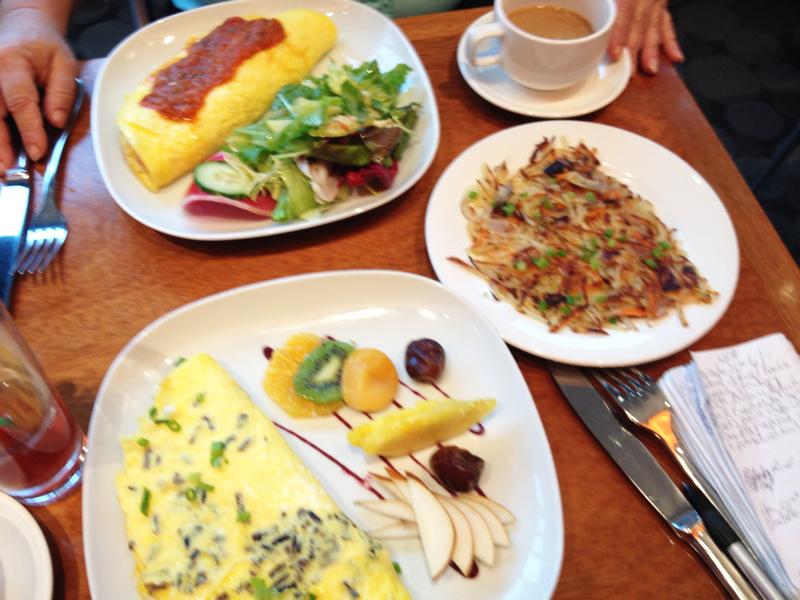 I settled on a special omelet with wild rice, squash, leeks and Amish cheddar cheese. I had a side of their vegetable and potato hash browns with it. All tasted fresh and was excellent. Jaimee said the same of her ham, roasted potato omelet. 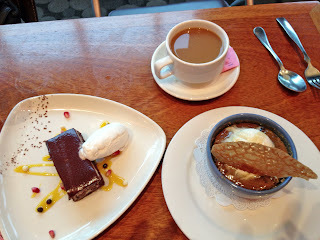 We were pretty stuffed, but I’m easily tempted with dessert. We decided on the Toffee Pudding and a heavenly looking chocolate cake, only we wished we were able to finish them. From Spoonriver we went to the Walker Art Center. We walked around this modern museum for quite a while. I was especially enthralled with a Cindy Sherman photographic exhibition (the exhibits here change here often). Jaimee and I still needed to work up an appetite so we left the car and walked to the Prairie Kitchen and Bar in the Hyatt Regency Minneapolis. It was late afternoon and we caught the end of lunch, but the food tasted just as fresh as it had in the previous place. I had a delicious combination of the roasted chicken and herb soup with wild rice and a goat cheese and Lingonberry tart. Jaimee had the Walleye & Chips, a specialty since the fish is caught nearby. She really liked that too. Andrew, the manager, and Eric, the chef, both came by to greet us and explain how the menu changes seasonally and they try to keep specials based on what’s available. We were also convinced here to try some dessert and did so with no regrets. 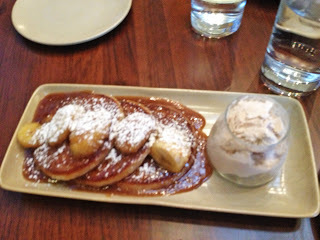 Another specialty of the house was brought out… Sweet Vanilla Pancakes, served with bananas and locally made cinnamon ice cream. Before I left Minneapolis, I had one last stop to make. It was downtown in the pedestrian Nicollet Mall. The Mary Tyler Moore statue stands there and, just as she did in the opening sequence to her 1970s show, she’s throwing her hat up in the air and cheering the city.